St Teresa (1515-1582) was born at Avila, Spain. Her mother died when she was 14, “Prompting her to embrace a deeper devotion to the Blessed Virgin Mary as her spiritual mother”. 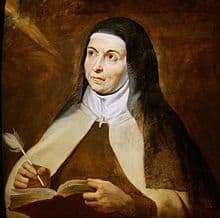 St Teresa entered a cloistered life with the Augustinian Order. While there, her health deteriorated but her religious and mystical experiences flourished. In 1535, she entered a Carmelite Monastery but was unable to find the deep devotional prayer life that she had hoped for. St Teresa once wrote, “Praying is an act of love, words are not needed. Even if sickness distracts from thoughts, all that is needed is the will to love”. With the help of others, St Teresa founded new houses within her Order but not without many difficulties. Her rules were more strict, placing greater emphasis on living a simple life of poverty and prayer. Catholics often associate St Teresa with the venerated image of the Infant of Prague. She is a Doctor of the Church and Patron Saint of Spain. Her Feast Day is the 15th October. nearer to me than my hands and feet. CategoriesSaints Library TagsSaint, Teresa of Avila, Who was Teresa of Ávila (Teresa of Jesus)?